Preston Mommsen will captain Scotland as they tour Australia and New Zealand later this month in preparation for next year's cricket World Cup. Scotland head coach Grant Bradburn revealed the news as he named his squad for the seven-match tour. "It is deemed a great honour to captain Scotland," Bradburn said. "It's imperative that a captain can command with his performance and Preston Mommsen has thrived in recent times in this capacity." Preston Mommsen (captain), Kyle Coetzer, Josh Davey, Alasdair Evans, Gordon Goudie, Michael Leask, Calum MacLeod, Richie Berrington, Freddie Coleman, Matthew Cross, Hamish Gardiner, Majid Haq, Matt Machan, Safyaan Sharif, Rob Taylor, Iain Wardlaw. Mommsen, a South African-born batsmen, made his Scotland debut against the Netherlands in 2010 after living in Edinburgh for more than four years. 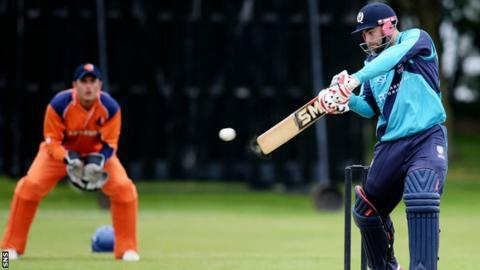 The 26-year-old scored 520 runs in eight innings and was named player of the tournament at the ICC qualifying event earlier this year as Scotland sealed a spot at the World Cup. With Mommsen taking the place of regular skipper Kyle Coetzer, who is in the squad for the tour, Bradburn also said that the captain for the World Cup in New Zealand will be named when the squad is announced. "We now have a number of potential leaders and players who are desperate and proud to lead their country," he added. Scotland head off on tour on 22 September and return on 24 October. They will take on the Tasmanian Tigers and Queensland Academy of Sport XI's before making the trip over to New Zealand and playing a NZ invitational XI plus three NZ domestic first class sides. All games will be 50-over fixtures. "This tour will allow us to have a good mix of game and training time," Bradburn said. We have 15 games between now and the World Cup, and this initial tour allows us to work through our combinations and game plans. "Strategically, we have chosen some quality training opportunities and opposition. It's a chance to really improve on playing spin and quick pace - something we don't get the opportunity to do as much as we would in our home conditions."